SUMMER CLASS AND CAMP SCHEDULE NOW AVAILABLE!! located in beautiful southern Frederick County Maryland near the Villages of Urbana. We offer a variety of classes to choose from, such as ballet, tap, jazz, hip hop, pointe, tumbling, contemporary, modern and much more for both the recreational and competitive dancer. Our programs serve beginner through advanced students aged two and a half and up. We also welcome college and pre-professional students in their continued training toward mastering technique. To stimulate one's creative spirit, inspire personal growth beyond perceived limits, and transform mentally, physically, and artistically through a balanced, well-rounded dance education that lasts a lifetime. And by sharing a passion for dance as a means for creative expression and life-long wellness. Urbana Dance believes that introducing and enriching your child in dance is a wonderful gift that will last a life time! Dance teaches poise, body alignment, promotes good posture, healthy habits, musical awareness, and develops rhythm and coordination. Dance increases strength, flexibility and exercises cognitive abilities. Involvement in the many forms of dance allows the student to explore movement, music, and creative expressions as they learn to dance in a structured and positive environment. Dance is an athletic art form that sharpens the student mentally, physically, and artistically. Our dancers of all ages and levels share one common factor, they love dancing at UDS. Don't miss the latest up-to-date studio information. Follow us on Facebook. 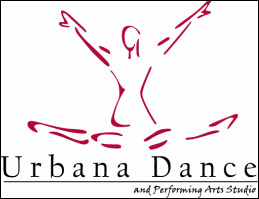 Urbana Dance offers several performance opportunities with different requirements, goals and levels of commitment. To see more videos & to learn more about our competitive team, click here. We offer a wide range of classes for kids 2.5 to adult. To see our schedule, click here. UDS offers studio space for birthday parties, meetings, classes & more. For more information, click here.